​As I mentioned in my Miller Family History narrative, Philomena was a discovery made while tracing the history of Friedrich Eberling, my great-great grandfather. One always wonders why immigrant ancestors settle where they did. Though I did not know why Friedrich and his family specifically came to Huron County, Ohio, I had hoped to find a connection somewhere along my research path. Friedrich died in Bellevue, Huron County, Ohio on 25 March 1925 and in his obituary in the Bellevue Gazette newspaper on 27 March 1925 it listed as a survivor one sister, “Mrs. Hasselbach, east of town.” So the journey began. I discovered her name was Philomena and upon finding her obituary in the Bellevue Gazette on 22 February 1926 the story unfolded. Germany was by wagon to Nassau on the Lahn River. Philomena left her home on the Aar River where it empties into the Lahn River, and went to Nassua and joined the Hasselbach Family for the journey to America. From there by train to Coblenz on the Rhine River and by boat to Koein, and then by train to Bremen Harbor. This took a week and passage to New York was another 58 days. The account also mentions that upon her arrival in Ohio she went to work for her future sister-in-law, Catherine Hasselbach Schild, at Schild’s Store and Tavern in Hessville, Ohio for a time. Charles P. Hasselbach, the second son and third child of Peter and Marie Catherine (Meyer) Hasselbach, spent much of his youth in his parents’ home assisting in farming and attending school until he was 14 years old, when he was confirmed a member of the Evangelical Christian Protestant Church of Ackerbach. In his youth he worked for farmers in the community. In the “Fatherland” he made the acquaintance of Philomena Eberling, the daughter of Frederick and Eva (Writz) Eberling. Once in America they were married the following spring in May of 1865 at Bellevue, Ohio, by Reverend Dornbier of the Lutheran Church. Charles continued to work for farmers around Bellevue for four years, then rented a farm and after six years bought a farm of his own. This farm they sold again after four years and again farmed rented land for thirteen years. In 1892 they bought a farm of 74 acres on Monroeville Road, about a mile from Bellevue, which they improved it in fine condition. They are members of the Lutheran Church and Charles and his sons are firm supporters of Democratic principles. Taken from History and Genealogy of the Hasselbach Family in America, 1781-1910, by John C. Overmyer, B.C.E. author. C. B. Bellman Press, Fremont, Ohio. (pages 89-90). Charles and “Bena,” as she was fondly called, were soon married. In researching church records at St. John’s Lutheran Church in Bellevue, Ohio it is recorded in the oldest book of church records, (all in German) on page 100, line number 2, the marriage of Charles and Philomena was recorded as 28 May 1865. I have obtained a copy of the marriage license, which was issued in Erie County, Ohio. Charles and Bena would have three children. William (13 April 1866-26 May 1953), Elizabeth (Buck) (5 December 1868-28 April 1963) and Carl P. (26 September 1877-4 May 1945). On the U.S. Census of 1900 the family was living on a farm east of Bellevue, Ohio, in Lyme Township, Huron County, Ohio. 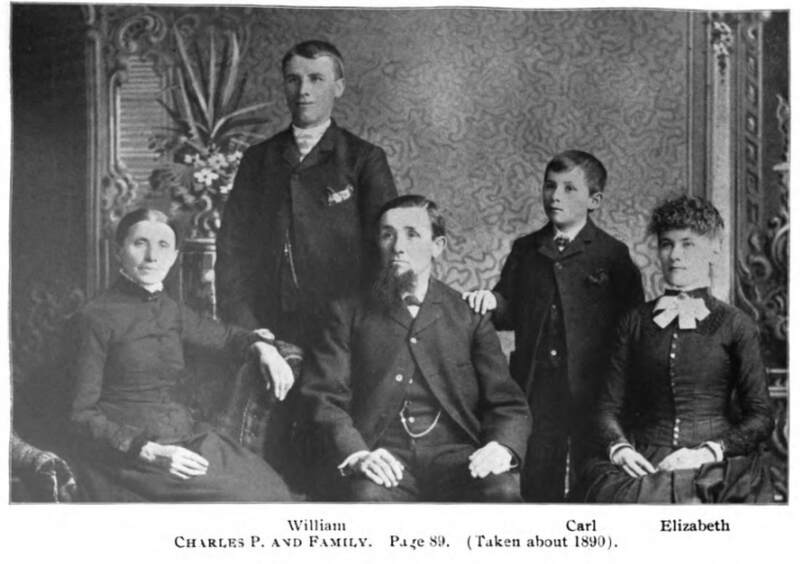 The 1910 census shows the same with sons, William and Carl, both single, living in the same household. I now wonder if Friedrich Eberling and his family may have stayed with this family for a time after they immigrated in 1884, since I have found no evidence that Friedrich ever rented or owned any land in Huron County prior to 1920. Charles died in Bellevue, Ohio on 12 July 1922 and was buried in Bellevue Cemetery. (FAG ID#173129815) Philomena continued living on the family homestead with her sons William and Carl until her death on 20 February 1926. Bena (FAG ID#173129807) was buried next to Charles in the Bellevue Cemetery Lyme Township, Bellevue, Huron, Ohio, Section 10, Row 31 (8 & 10). Church burial records confirm Philomena’s funeral services (page 286) were held at the family home in Lyme Township through St. John’s Lutheran Church with Reverend A. A. Ahn oﬃciating. Her obituary is quite detailed and can be accessed online. She was 89 years of age and died on 20 February 1926. Her parents are listed as Fred Eberling and Catherine Reitz. It is interesting to note that the church that Elizabeth was baptized at in 1869, St. Peters Lutheran Church in Pontiac, Peru Township, Huron, Ohio, is the very church that her cousin, Nettie Eberling, would be married in to Wilhelm Mueller in 1886. ​Carl Philip Hasselbach (KL78-NY2) was born in Erie County, Ohio on 26 September 1877. He remained single most of his life and lived and farmed alongside his parents. After their deaths he eventually married at age 51 on 17 May 1929 in Huron County, Ohio to Mamie M. Parker. She was widowed and was born in Tablerock, Nebraska on 27 May 1884. She was the daughter of William Pattison and Fannie B. Fitzpatrick. They were still married when Carl died on 4 May 1945. It appears that Carl never had any children. He was buried in the Hasselbach Family plot at Bellevue Cemetery in Bellevue, Ohio. (FAG ID#173200274) Mamie’s death and burial is unknown. It is important to note that as of this date no one with the last name of Hasselbach lives in Bellevue, Ohio. However, there are extended family members related to this clan still in the area. Author's Note: "Bena" is my great-great aunt.